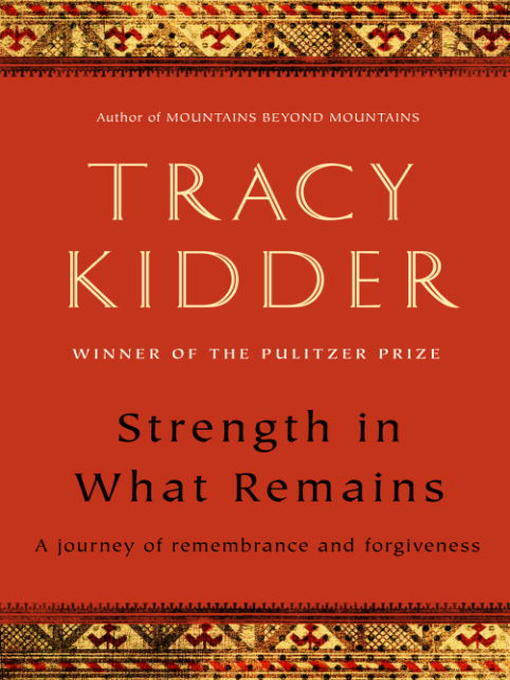 In Strength in What Remains, Tracy Kidder gives us the story of one man's inspiring American journey and of the ordinary people who helped him, providing brilliant testament to the power of second chances. Deo arrives in the United States from Burundi in search of a new life. Having survived a civil war and genocide, he lands at JFK airport with two hundred dollars, no English, and no contacts. He ekes out a precarious existence delivering groceries, living in Central Park, and learning English by reading dictionaries in bookstores. Then Deo begins to meet the strangers who will change his life, pointing him eventually in the direction of Columbia University, medical school, and a life devoted to healing. Kidder breaks new ground in telling this unforgettable story as he travels with Deo back over a turbulent life and shows us what it means to be fully human.